Sounds odd? It is. As the prince you start at a microscopic level and roll a big ball around. The ball has some numbs sticking out of it and is called the Katamari. As you roll around things stick to the Katamari if they are small enough compared to it. As more and more things stick to the Katamari, it grows, allowing you to pick up the larger objects that you couldn’t pick up before. The first level starts your Katamari off at 5 cm. 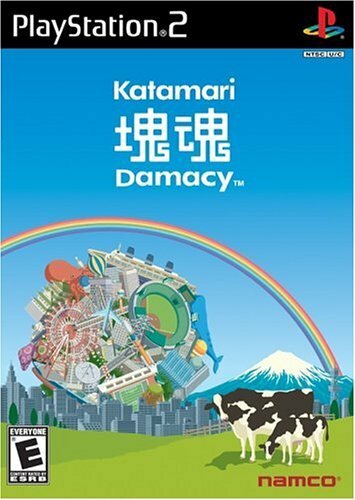 By the end of the game your Katamari is measured in km. Along the way the game smoothly transitions from objects that are tiny (thumbtacks, little candies, etc) to larger things like cars and people and then to ludicrously large items like buildings and supertankers. The gameplay is fairly simple. Each level (with a couple exceptions) you are given a goal size of your Katamari and a time limit. From there you just roll around and try to get your pile of stuff as big as possible. It sounds like it would be monotonous or too simplistic to be fun, but it is remarkably engaging and rewarding. I had a ton of fun and an amazing drive to get to the next level. The graphics do a great job of scaling from tiny to huge. Everything looks crips and nice, and a bit stylized. The music is impressively varied for a video game and is all nicely tongue-in-cheek. This is a great game and I would definitely recommend it to anyone.